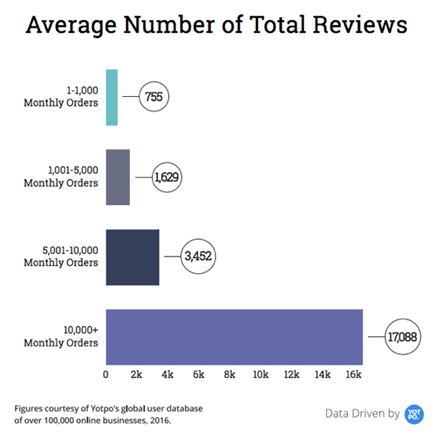 Average order value, retention rates and how frequently customers post reviews are key to success when selling apparel online. The fashion industry is estimated to rake in some $332 billion in revenues from e-commerce alone by the end of 2017, making it the world’s largest online retail sector. An increasingly large portion of those sales are happening online, too. In United States, the fashion e-retail industry is estimated to have collected $63 billion in 2015 and is predicted to hit $100 billion by the year 2019. The online apparel market is showing healthy growth, at an estimated annual rate of 17.5% through 2018. As fashion e-commerce expands, brands are getting increasingly savvy about collecting and leveraging the masses of data being generated by online shoppers. Most small or medium e-retailers just don’t have the resources to measure everything. Instead, try a more strategic approach by analyzing these three key metrics that have real meaning to your business. Knowing what data you really have access to, and how it can be applied, is a strategic challenge. For example, many brands look at their shopping cart abandonment rates and draw conclusions about website conversion rate improvement opportunities there. Others may use product-specific data to improve inventory management protocol. Still others analyze their data based on buyer persona parameters like the geo-locations of customers, which can help optimize subsequent marketing efforts. Especially when it comes to benchmarks, though – those wily stats that are only going to be somewhat applicable to any individual business – it can be hard to find data sets that speak specifically to your niche. If you’re in the fashion e-commerce sector, it’s important to focus on the right metrics, so you can meaningfully measure your website’s business performance. Yotpo, a platform that helps e-commerce marketers leverage the power of user-generated content, recently analyzed a massive amount of data from their 100,000-plus customers to uncover industry benchmarks that provide actionable insights. Yotpo’s findings, which can be accessed in their fashion e-commerce metric report, provide a valuable starting point for any marketer operating in this niche who seeks to compare business performance with his or her peers. Let’s drill down into three specific areas – average order value (AOV), retention rates and average rate of reviews – to gain a better sense of how online fashion shoppers interact with sellers’ sites. According to the benchmark report, the AOV – the average value of all customer orders – across the fashion and apparel segment is $97. They also note that as the average fashion site’s number of monthly orders increases, the AOV drops. Larger brands tend to have smaller AOVs, simply because they have more orders, as shown in the chart below. 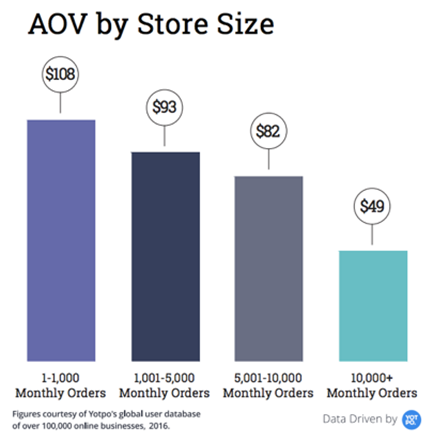 In fact, the sites that do the least business, with under 1000 orders per month, average well over two times the AOV as sites with the most business, with over 10,000 orders per month ($108 vs. $49). If your AOV, then, is on the low end, but you’re seeing a relatively large volume of transactions, don’t fret – you’re still likely to have 4.5x more revenues than the smallest players in your niche. It’s important to remember, though, that AOV doesn’t address sales per customer, and it doesn’t describe profit or profit margins – although it can give you some indications of these related figures. For instance, if an online fashion retailer sells three shirts, priced at $15, $21 and $29, but has an AOV of $19, this tells us two things: the lower-end shirts are making up most of the sales, and customers aren’t buying multiple items. Interestingly, the study found the average cart size to be 1.74 products per order, with relatively minor deviations for order volume, which indicates that your order value is likely unrelated to your average number of products per order. Instead, focus your marketing efforts on where your profits are. If more expensive items have higher margins, focus your marketing and positioning efforts on those products. This helps increase AOV, which increases ROI on your customer acquisition efforts. Repeat buyers pivotal to any business, and fashion e-commerce is no exception. 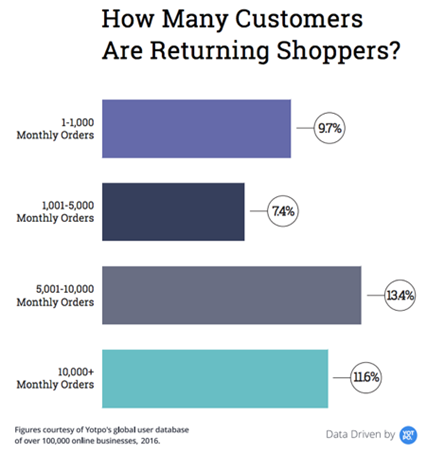 According to the data, between 9.7% and 11.6% of fashion e-commerce customers come back for more, regardless of the store’s order volume. These figures are notably lower than automation platform Ometria’s findings, which show fashion sellers receiving repeat orders from some 10% to 20% of their customers. Repeat business is an especially important aspect of your company to keep an eye on, because returning customers are much easier to sell to than first timers – customer acquisition costs about seven times more than customer retention. Focusing on keeping customer acquisition costs low won’t help increase profits if you’re churning customers left and right. If you have a disproportionate share of one-and-done purchases, then you’ll need to spend too much over time in order to keep earning. Fashion e-commerce brands would do well to track the percentage of customers who post reviews. The Yotpo report reveals that stores with the lowest order volume have the least amount of customer reviews on their site. According to Pew Research, 77% of shoppers say it’s important to be able to read reviews of products from other customers before purchasing. What’s more, some 82% percent of U.S. shoppers will check reviews when buying something for the first time, and close to half of those shoppers feel that reviews help make them feel comfortable about their purchases. It’s not surprising, then, that sites with higher review rates tend to have higher conversion rates, better customer acquisition rates and more orders. Yotpo notes that when stores email shoppers and ask for reviews, 43% open those emails and nearly 11% of those customers write reviews. This number goes up to around 13% for smaller stores. Work to increase your AOV, as this will help reveal the channels that allow you to make the most of your acquisition efforts. Remember that AOV can vary considerably, depending on the size of your business. Invest in incentives to encourage repeat buyers and build loyalty, in order to extend customer lifetime value. As long as roughly 10% of your customers come back for more, you’re on par with e-commerce fashion averages. To help boost overall profits and improve both conversions and retention, make sure it’s easy for visitors to see and for customers to leave product reviews. Smaller shops have an easier time drawing reviews from buyers than bigger shops, but there are tactics that can maximize any business’s chances of attracting useful UGC. TK DataSec Consultancy provides advice on e-commerce security.